Precious metals expert Michael Ballanger riffs on the news that Deutsche Bank is settling U.S. silver pricing litigation. After what seems like a lifetime of serial denial by the MSM, of total head-turning by regulators, of behind-the-back snickering by financial commentators, and of in-your-face continued manipulation by the bullion bank behemoths, Reuters has finally reported an event that might—repeat—MIGHT be a game changer for those involved in silver trading and investments. 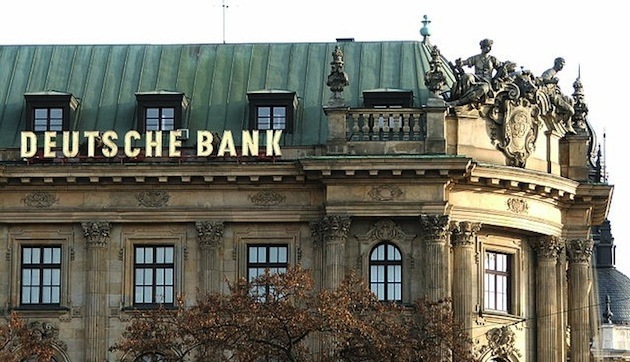 At 7:09 last evening, it was reported that "Deutsche Bank to settle U.S. silver price fixing litigation," which is a staggering admission of that very criminality of which I have been ranting, writing and opining for years now. Read the actual report here. What is way more significant than a diseased, derivative-addled, sovereign-debt-impoverished institution admitting to defrauding us of hundreds of millions of dollars through price-rigging, Deutsche Bank have named two other institutions as co-conspirators in the fraud, HSBC and that venerable Canadian "Big Five" bank, The Bank of Nova Scotia. Being a Canuck, I find it at once both infuriating and thrilling that a member of one of the most notorious cartels in global financial history ("The Big Five Canadian Banking Cabal") has been NAMED in the settlement. Mysteriously absent, of course, are JPMorgan and Goldman Sachs, for the reason that by way of settlements, JPMorgan is the undisputed king of criminal activity, so to think that they were absent from this massive, multi-decade HEIST is simply illogical at best and naïve at the core. From a personal standpoint, I am luxuriating in the knowledge that GATA's Bill Murphy and Chris Powell (as well as all of we the card-carrying members of the tinfoil hat brigade) have been vindicated in the sense that the Doug Casey's of the world can no longer stare into a webcam while pumping newsletter subscriptions and deny the presence of intervention and manipulation in the metals markets. The Bart Chiltons and the Gary Genslers all owe Bill and Chris a) a huge apology and b) a big fat cheque for the money that they have liberated from the GATA founders and its members. Sadly, for those out there that are shopping for new cars in anticipation of receiving a settlement from Deutsche Bank, you better be looking at the 2025 model year. However, from a trading perspective, the DB settlement is going to, at the margin, relieve the pressure that has been exerted on silver prices for at least since April 2014. It also serves to cement my thoughts that the Gold-to-Silver Ratio ("GTSR"), currently at 76:1, is headed to 50:1 and remains a truly generational buying opportunity. So ,now that the Cretins have been outed and now that we KNOW that the precious metals markets are seriously "rigged," does it give us cause to rejoice in higher prices? Well, of course not, as can be seen from Goldman Sachs' recent $5.2 billion SEC settlement, which has resulted in a) no indictments of senior Goldman officials, and b) damage to shareholders. You will further note that not one Goldman executive was fined; it was the shareholders of GS that paid the fine. In similar fashion, Deutsche Bank has rallied nearly 10% since Tuesday and none of the DB senior execs are being fingered. Accordingly, today's $20 slam in gold and $.135 hit in silver reflects the brazenly "business as usual," laissez-faire attitude of the crime-committers as they mark down metals prices with reckless abandon and total impudence. Thanks to a progressively rising open interest in Crimex paper gold, the bullion banks have been able to dampen all speculative demand in the past week and with price being pressured today, it is a strong probability that tomorrow's COT will show deterioration, mainly in gold. (The silver COT could easily see further improvements on last week's stunning turnaround in the commitments of the big silver players.) For now, however, the NYSE Arca Gold BUGS Index (HUI) trades mainly off gold, and with gold down over $20 going into NFP "Freaky Friday," I would have to remind everyone of what I said back in late February, "I am not a bear but make no mistake—I look for a bone-jarring correction starting in March-April that will singe the eyebrows." If we get a friendly number tomorrow, these master manipulators could give gold the type of "nudge" that could have it under $1,200 by 9:00 a.m…. As for the miners, it is unfathomable that the HUI has had only two down days in a row since Jan. 19. We saw new highs in the HUI to nearly 210, and since I started getting cautious at 170, I left a great deal of profit on the proverbial table. However, every major NEW bull market, especially one that has been absent for as long as the Golden Bull was, absolutely MUST have that initial blow-off that crushes the late-comers and sends people scurrying to the sidelines. If tomorrow is a third down day and is a crusher, I believe it will continue until mid-late June with many former gold bulls sporting no facial hair and singed eyebrows while waving the American flag on the Fourth. Hail Deutsche Bank! Stepping up next to the Window of Shame: Scotiabank and HSBC! 1) Statement and opinions expressed are the opinions of Michael Ballanger and not of Streetwise Reports or its officers. Michael Ballanger is wholly responsible for the validity of the statements. Streetwise Reports was not involved in any aspect of the article preparation or editing so the author could speak independently about the sector. Michael Ballanger was not paid by Streetwise Reports LLC for this article. Streetwise Reports was not paid by the author to publish or syndicate this article.